Over its years in the industry DyCom has developed a complete set of technical services that make possible to support our wireless solutions over their complete lifecycle. This set of services allows organisations to complement their own ICT capabilities, protect their capital investment on wireless communications equipment and strategically manage their communications assets. DyCom services are delivered using technical resources from our technology partners, our network construction partners, our regional support partners and DyCom Group engineers ensuring a broad spectrum of skills and experience. Within the DyCom Group we have not only experienced wireless engineers but also skills in IP networking, CCTV and Access Control, Remote Desktop, Virtual Computing and Applications. Our wireless services are shown in the above diagram. 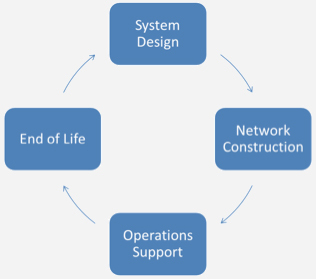 System Design Services are the first stage of a project and take an idea to a wireless system specification. Once the project is given the go ahead our Network Construction Services start by deploying the systems and integrating them to the customer’s network. After the system is commissioned our suite of Operations Support Services kick in to assist customers to protect their assets. End of Life Services help our customers decommission equipment and dispose of them in an environmentally-friendly way. Wireless Systems Design are a key part of our service offer. Network Construction Services start after the customer has given the go ahead and a contract is in place. Wireless Operations Support Services are provided as part of our services continuum. At the end of the customer’s wireless solution lifecycle, our Wireless End of Life Services begin. We have developed long standing relationships with a selected group of contractors that deliver the construction aspects of the project. We work with them because they are experts in their fields and have demonstrated a strong commitment to customer service, safe work practices and excellent quality. Our regional support partners assist us in supporting our customers in regional Victoria and New South Wales. They deliver fast response times in case of technical incidents and maintain a level of spares required to ensure that service level agreements are achieved.